io9 needs your mail… to save the world! 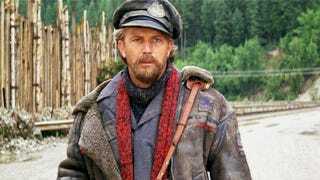 In Kevin Costner's undisputed cinematic masterpiece The Postman, we learned that after the apocalypse, the only thing that we need to rebuild civilization is a semi-functional postal system. Not food, not electricity, not weapons - we just need a dude on a horse with a bag who's willing to deliver pieces of paper to other places. THAT'S ALL. NOTHING ELSE. STOP QUESTIONING IT. It is in this spirit that I, Rob Bricken, am announcing io9's new mail column, "Postal Apocalypse." In it, I will answer any question you have, whether it be about Game of Thrones, Star Wars, comics, RPGs, science, books, fandom, what if scenarios, recipes, survivalism tips, anything you want. No question is too dumb, although there are many, many questions that will likely be way beyond my poor, whiskey-soaked brain's comprehension, although that means you smart people can laugh at my answers. Anyways, all you have to do is email me at postman@io9.com with these questions, and I'll "deliver" a new batch of answers every Wednesday. And together, we will save this broken world. WE'LL SAVE IT THROUGH THE POWER OF MAIL.